Whether it be NAFTA renegotiations, Canada 150 celebrations, Bill Morneau’s ethical complications, or Brian Pallister’s New Mexico and tuition hikes – 2017 was a busy year in federal and provincial politics. With Prime Minister Justin Trudeau facing off against US president Donald Trump, recreational marijuana slated for legalization, and looming provincial and federal elections, 2018 should prove to be even more interesting. As we enter the Chinese zodiac year of the dog, a year that some astrologers warn may be one of “transient melancholy,” allow us to put a positive foot forward by considering the top five Canadian politicians that Manitobans should be watching this year. So, here are the politicians you should keep tabs on in 2018. And just a warning, Justin Trudeau is not on this list, as we will all be watching him anyway. By all accounts, 2017 was a year of ups and downs for Manitoba NDP leader Wab Kinew. The former musician, broadcaster, and university administrator made history in September when he became the first Indigenous leader of a major provincial party. Revelations of domestic violence charges filed against Kinew over a decade ago – that have since been dropped – and details from another violent incident more than 10 years ago between Kinew and a Winnipeg taxi driver flattened his NDP leadership victory party. If Kinew’s personal history tells us anything, however, it is that he has a knack for bouncing back. In 2018, watch for an energized and active NDP leader. Kinew needs to sell his party’s vision to young and Indigenous Manitobans if he wants to unseat the current PC provincial government, which is sitting at about 40 per cent approval according to a late Dec. 2017 Probe Research poll. 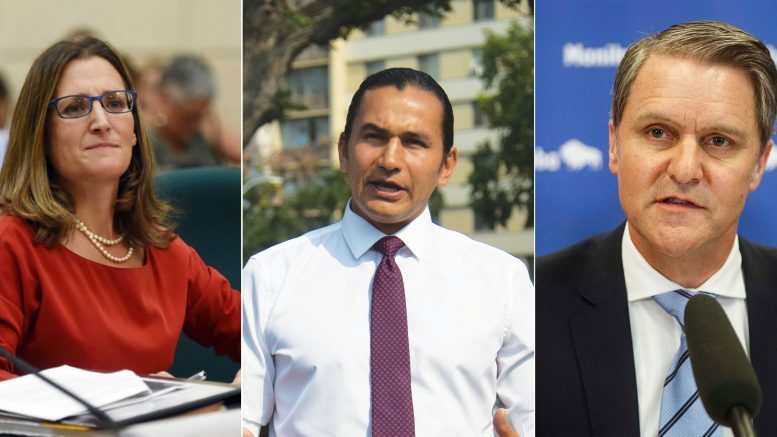 Kinew also needs to tap into the frustrations growing around the provincial government’s healthcare cuts – especially in Winnipeg, where the majority of the NDP’s support lies – if he wants to make gains in 2020. Staying in Manitoba for a moment, the provincial PC politician to watch in 2018 will be finance minister Cameron Friesen. After last year’s provincial budget fell flat for fiscal conservatives in terms of cutting costs – the deficit at the end of 2017 was $827 million – 2018 will likely see Friesen cut even more to work toward a balanced spreadsheet. After a year of repeatedly being among the last standing naysayers in financial negotiations with the federal government – first with healthcare transfers, then with the carbon tax, and later with revenue sharing with Ottawa of marijuana taxes – the provincial government will have to come to final deals with the feds, or else risk having national standards imposed on Manitoba. In 2018, Friesen will likely be making quite a few trips to Ottawa. Speaking of conservatives, the first federal politician to watch in 2018 is Conservative Party of Canada leader Andrew Scheer. When the cheery-faced Saskatchewan MP won the Conservative leadership race by less than a hair in May, not many Canadians knew who he was. Now, as Scheer begins to build a public profile – he was Google’s top trending Canadian politician searched in 2017 – and his party continues its relentless attacks on the Liberal government in question period day after day, the question of whether Scheer can garner enough support to dethrone the high-flying Trudeau government in 2019 will be tested this year. Since Scheer’s leadership win, the Conservatives have been sitting at around the same polling numbers as when they lost the 2015 federal election. In 2018, the Conservative leader will continue his question period assaults on Bill Morneau’s and the Prime Minister’s ethics. He will also spend time travelling across the country to build his “conservative with a smile” brand. The Conservatives will be looking to pick up seats in the prairies, where the Liberal government’s polling numbers are fading. Watch for visits by Scheer to Manitoba. The Conservatives were not the only federal party to get a new leader in 2017. In October, the federal NDP decisively elected Jagmeet Singh, a bright and promising Ontario MPP as their new leader. Singh’s election was another monumental first in Canadian politics: he is the first non-white leader of a major federal party. Singh, however, decided not to immediately run for a seat in Parliament, choosing instead to criss-cross the nation in a “Jagmeet and greet” tour to boost the NDP’s public image after disappointing losses for the party in the 2015 election. Unfortunately for Singh, the tour has not seemed to have much effect so far – in four recent by-elections throughout the country, the NDP gained zero seats – but Singh’s leadership is still in its early days. In 2018, Singh will continue his national tour while his former campaign challenger, Guy Caron, will continue to do an amicable job of organizing his party on Parliament Hill. Watch for a youthful and inclusive re-branding of the NDP in 2018 under Singh’s leadership, especially as Thomas Mulcair, Singh’s predecessor, quits federal politics for good in June. The year 2018 is going to be challenging for the Trudeau Liberals in the sphere of international affairs. Fallout from Trump’s Middle East policies, growing far-right populism in Europe, ethnic cleansing in Myanmar, NAFTA troubles, chaos in Somalia: the list of crises Foreign Affairs Minister Chrystia Freeland will continue to deal with in the coming year goes on. Freeland, who was promoted to the foreign affairs cabinet role in January 2017 following her successes in negotiations of a European Union free trade deal, will need to pull out all the stops for the ongoing NAFTA renegotiations, which are proving to be challenging on the best of days. With Canadian jobs on the line and a U.S. president who seems to threaten total withdrawal about once a month, Freeland has her work cut out for her in the coming year. In 2018, Freeland will presumably become more bullish about Canada’s interests in the free trade deal. Expect trips to D.C. and Mexico City to increase, especially as Mexico goes to the polls to elect a new president in July. And NAFTA is only one of Freeland’s major challenges for 2018. Bob Rae, Canada’s special envoy to the Rohingya crisis, is already calling on the government to investigate possible war crimes in Myanmar. Expect some form of action from Global Affairs Canada in the coming weeks. For the Trudeau government, Freeland will be one of its greatest assets in the lead up to the 2019 federal election. Watch for the Liberals to back her actions with zeal. As we finish the New Year’s Eve bubbly and politicians get back in action for 2018, be sure to have some popcorn ready for another captivating year in provincial and federal politics.